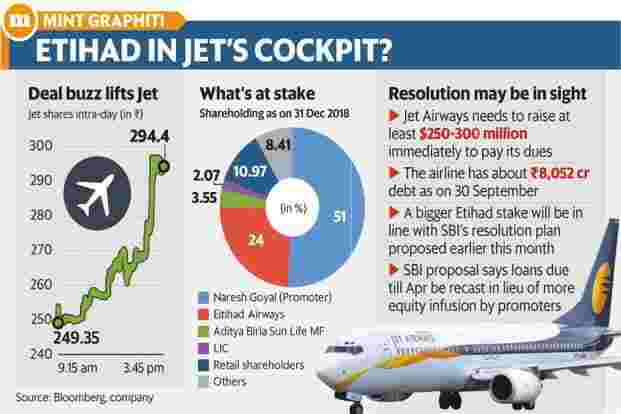 Mumbai: Etihad Airways PJSC may gain effective control of Jet Airways (India) Ltd, if lenders approve a resolution plan for the cash-strapped local airline, according to two people familiar with the ongoing discussions. The plan could see Etihad Airways raise its stake from the current 24%, and Jet Airways’s promoter and founder Naresh Goyal cede control of the airline that began operations more than two and a half decades ago, said the people cited above, requesting anonymity. “Given the precarious financial situation of Jet Airways, lenders don’t expect Goyal to bring in additional funds and are banking on Etihad to bail the airline out," said one of the two people cited above. “Etihad has agreed to increase its stake in Jet Airways and will bring in fresh capital to the company. Etihad is also in talks with several foreign lenders to refinance a large portion of Jet Airways’ rupee and dollar debt which are heading for maturity in the next few quarters," the person said, adding “Etihad’s stake acquisition is however contingent on Goyal relinquishing control by capping some of his promoter rights." An increase of stake by Etihad Airways will be in accordance with the resolution plan proposed by State Bank of India (SBI) to Jet Airways’ foreign lenders and vendors earlier this month. Domestic lenders, led by SBI, are scheduled to meet on Wednesday to take a final decision on stake increase and restructuring, said the two people cited above. SBI had earlier this month proposed local lenders recast Jet Airways’ loans maturing till April 2019 in lieu of additional equity infusion by the promoters. A spokesperson for Jet Airways was not immediately available for comment. “Etihad Airways does not comment on rumour or speculation," a spokesperson said in an email. A potential control of Jet Airways by Etihad will allow the Abu Dhabi-based carrier make a deeper foothold in the world’s fastest growing civil aviation market by exploiting Jet Airways’s network in India while also exploring more synergies for overseas operations. Etihad can also leverage Jet Airways position as one of the largest international airlines from South Asia to get more travellers flying to the West through its hub in Abu Dhabi. Gaining control of Jet Airways by Etihad, owned by the Abu Dhabi government, is also expected to make it easier for the Mumbai-based carrier to raise debt locally as well as from overseas. Mint had on 13 November reported Goyal may have to give up operational control for an investment in Jet Airways. The first person said “Etihad also wants its board representation in Jet Airways to go up from the two seats it has now". Under Indian laws, foreign carriers can own only up to 49% stake in a domestic airline. The rules also stipulate that management control of a domestic airline should remain with an Indian entity. “Various options are on the table," said the second person cited above. “While it is possible for Etihad to straightaway hike its stake, it will however have to tender an open offer under the takeover rules under this scenario." “This is not an ideal situation because the proceeds of the open offer will not come to company and will go to the shareholders instead," the second person said adding, “The option is for the lenders to convert a part of their outstanding debt into equity and then sell it to Etihad, which will then be exempted from an open offer under the RBI’s 12 February circular." “A conversion of debt into equity in Jet by the lender will bring down the stakes of all shareholders following which Etihad can again infuse additional money into the company to bring its stake back to the current level. Additionally, infusion of equity in the company will also improve Jet’s leverage ratio allowing to borrow afresh," the person added. “Etihad Airways will need to make an open offer to acquire up to 100% in Jet Airways if Etihad’s shareholding crosses 25%. But the foreign ownership limit in aviation is 49%. So, Etihad will have to divest its stake following the open offer to bring it down to 49%. However, Etihad may be given a three-month window or so to sell the excess stake to comply with FDI (foreign direct investment) norms," said a person close to the Securities and Exchange Board of India. Shayan Ghosh and Anirudh Laskar contributed to the story.